Astronomers have identified for the first time one of the key components of many stars, a study suggests. A type of gas found in the voids between galaxies – known as atomic gas – appears to be part of the star formation process under certain conditions, researchers say. The findings overturn a long-standing theory about the conditions needed for star formation to take place – a process that happens when dense clouds of dust and gas inside galaxies collapse. 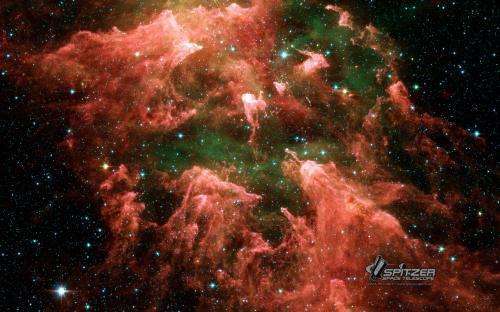 It was previously thought that stars could form only in the presence of a different type of gas – called molecular gas. Atomic gas is composed of individual hydrogen atoms. It is usually found in regions of space that do not contain any planets or stars and are largely empty, researchers say. Molecular gas is made up of pairs of hydrogen atoms bound together, and is present in the densest parts of galaxies, where most planets and stars form. The new study, led by the University of Edinburgh, provides the first evidence that atomic gas can fuel star formation. This happens when atomic gas flows into galaxies but does not have time to convert to the molecular form, the team says. The discovery was made by studying galaxies in which explosions of massive stars – known as gamma-ray bursts – have been observed. It was thought the stars formed from molecular gas, but recent studies have shown these galaxies to be almost entirely deficient in molecular gas. Using a radio telescope in New South Wales, Australia, researchers measured the levels of atomic gas present in the galaxies. The team found they contain large amounts of atomic gas, distributed close to gamma-ray bursts, suggesting it can act as the fuel for star formation. Stars form in the same way regardless of the type of gas involved, scientists say. Gas molecules are destroyed early in the process, so the stars they produce are the same, they add.